The North American Model of Wildlife Conservation (NAMWC) is often held up as the best system of wildlife management and conservation in the world. Developed in the post-frontier era, the NAMWC helped put a stop to wanton wildlife destruction in an era where many species were being hunted and trapped ruthlessly to the brink of extinction. But the tenets of the North American Model were developed in the 19th century, when wildlife ethics and science were a mere glimmer of what we understand today. The system was intended as a hunter-centric model, both guided by and benefitting consumptive interests. Growing skepticism about how well the North American Model serves not just the wild animals in our public trust, but also the conservation priorities of non-consumptive users who are the majority users of public lands. Increased scrutiny of practices long considered the norm in wildlife management, including predator hunts, commercial trapping, the legal culling of non-game birds like American Crows, and some of the research protocols used to track and translocate wild animals. A new willingness among scientists to consider certain moral and ethical implications with respect to wild animals, where previously utilitarian ideas prevailed, including ideas of intrinsic value. Serious examination of the national funding paradigm and how it contributes to the conservation choices made on both federal and state levels. This leads to obvious conflicts with the NAMWC prohibition against the frivolous killing and waste of wildlife. Given that few hunters actually consume coyotes, wolves, cougars, and except for a few individuals, even bears, it is obviously a “waste” of wildlife to shoot or trap these animals just for “fun”2. These voices come together on the central point that the North American Model is falling short in critical ways, that it’s outdated when juxtaposed against more progressive ideas in conservation, and that it’s time to seriously consider the shortcomings of our current paradigm while pushing for positive changes that can inform wildlife conservation decisions into the next century. A significant part of that transformation is recognizing the substantive blocks to change. And among the most important factors is funding and how the funding apparatus is tilted toward preserving the status quo. Non-consumptive users are accustomed to hearing that conservationist hunters not only fund wildlife endeavors but were also the primaries in early North American conservation efforts. For example, Theodore Roosevelt’s environmental victories are often cited without comparable mention of non-hunter John Muir’s critical influence over Roosevelt’s thinking on ecology, wildlife and environment. As such, non-consumptive users have historically been viewed as lesser stakeholders in wildlife management decisions. But is there validity to these commonly held ideas? 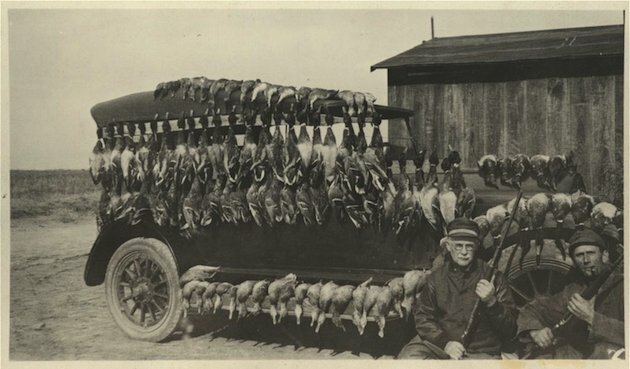 Michael P. Nelson, a Professor of environmental philosophy and ethics at Oregon State University, points out that recreational hunting was only one of several important factors that led to improved conservation in North America. He notes that “Beginning in the 1960s, for example, conservation was dominated by non-hunters whose legacy includes key legislation such as the U.S. Wilderness Act, Endangered Species Act, Clean Air and Water Acts, and similar acts in Canada. In addition, what are commonly referred to as “non-consumptive” uses of nature—such as national park visitation and bird watching—have also been important for motivating conservation action. These perspectives on the history of conservation do not stand in opposition to hunting, yet they show how other forces also shaped North American wildlife conservation, and how hunting is not necessary for conservation3. 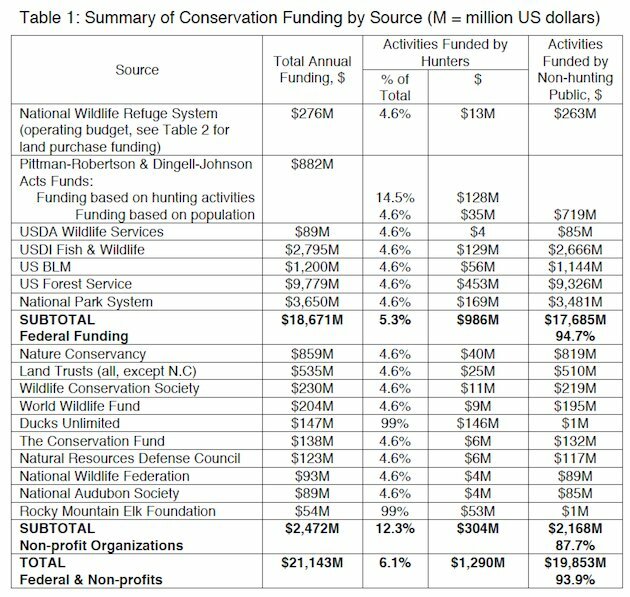 A new study authored by Mark E. Smith and Donald A. Molde, shows that approximately 95% of federal, 88% of non-profit, and 94% of total funding for wildlife conservation and management come from the non-hunting public. The authors contend that a proper understanding and accurate public perception of this funding question is a necessary next step in furthering the current debate as to whether and how much influence the general public should have at the wildlife policy-making level, particularly within state wildlife agencies4. Interpretation of these rights must be adaptable to contemporary concerns, such as biodiversity and species extinction. All three are impaired when the basis of public debate is a myth. It’s time that we call for honest dialog from our state and federal agencies and transparency in wildlife policy making. Wildlife has aesthetic, cultural, ecological, economic, intrinsic, recreational, scientific, social, and spiritual values that need to be acknowledged, preserved and passed on to future generations. Recognizing that wildlife has intrinsic value broadens conservation to include both individual animals and the populations they comprise. In other words, 21st century “geocentric” conservation must be concerned about the welfare of individual animals (traditionally termed animal welfare, or animal protection) and the welfare of wild populations (the traditional focus of progressive conservation). As a consequence, “people should treat all creatures decently, and protect them from cruelty, avoidable suffering, and unnecessary killing.” This principle reaffirms that animal welfare is an integral part of modern conservation. Conservation measures that compromise the welfare of individual animals to achieve goals at the level of the population should not be the preferred means of addressing wildlife conservation issues. Capturing wild animals for live trade and captivity should not be permitted. Bringing individual wild animals into captivity for short periods may be permitted, however, to deal with animal welfare issues such as disease, injury or estrangement. All attempts to domesticate wild animals should be discouraged. Efforts to protect and conserve wildlife and wildlife habitat should begin long before species become rare and more costly to protect. The maintenance of viable wildlife populations and functioning ecosystems should take precedence over their use by people. Recreational and other uses of wilderness must not compromise the very essence of “wilderness” as untrammeled wild lands, and any such uses should be compatible with this basic principle. Wildlife belongs to everyone and no one. It is protected and held in trust for society by governments or appropriate intergovernmental conventions (i.e. central management authorities at an appropriate scale). “Highly migratory species” belong to all nations and not just those that wish to exploit them. Effective conservation of wildlife relies upon a well-informed and involved public. Any material benefits derived from wildlife must be allocated by law – following consultation with the public, who collectively “own” the resource – and not by the marketplace, birthright, land ownership, or social position. All individuals share the costs of conserving wildlife. Those whose actions result in additional costs should bear them. The onus must be on those who wish to use nature and natural resources, e.g. exploiters and developers, to demonstrate that their actions will not be detrimental to the goal of achieving biological and ecological sustainability. required to determine those catch limits. Exploitation (and depletion) of wild living resources should no longer be subsidized by governments. The use of wildlife for subsistence purposes by human populations should not be equated with their commercial consumptive use. Human development should not threaten the integrity of nature or the survival of other species. Development of one society or generation should not limit the opportunities of other societies or generations. Each generation should leave to the future a world that is at least as biologically and ecologically diverse and productive as the one it inherited, and – given the current state of the planet – a world in which the physical environment (including the land, water, and atmosphere) is less polluted than the one it inherited. The establishment of protected areas – where human impacts, including exploitation and development, on wildlife and their habitats are reduced to an absolute minimum – is an essential component of any plan to achieve biological and ecological sustainability. Ultimately, human use of nature must be guided by humility, prudence, and precaution. The fathers of the conservation movement – including Gifford Pinchot and Aldo Leopold – have been dead now for more than 50 years. The conservation and environmental movements to which they contributed so much have been losing ground for the past 30. Dr. Lavigne concludes that to bring about the future, all conservationists should aspire to necessitate the creation of a New Conservation Movement, dedicated to gaining ground in the pursuit of ecological sustainability, and focused on the acquisition and use of political power to achieve it. Interesting post. There is a lot to think about seriously here. Full disclosure up front: I am an avid and unapologetic hunter, as well as a naturalist, birder and conservationist. I think the North American Model of Wildlife Management is certainly open to critique. The same goes for hunting and consumptive use of wildlife in North America. There is a lot about the “hunting industry” that is reprehensible and about as far from “ecological integrity” as you can get. Some behavior — the killing contests, etc — can’t continue. That said, I think the North American Model HAS been a roaring success in many ways. I’ve traveled widely to look for wildlife. There are not many places in the world where wildlife is so common (outside of national parks and select reserves), and where public lands are so accessible for so many to enjoy. Could wildlife management be better? Of course. But I find it striking that the mountain lion is still doing well compared to other big cat species around the world. I am not sure that the model proposed here charts a better future for wildlife. The North American Model is not perfect, and yes we need more constituents to have a say in conservation. But I still think it is better than most models. Another point I think this article misses is that the thoughtful, conservation-minded hunting/angling community can still be a powerful force for conservation. It is this community that has led the charge in protecting Bristol Bay from Pebble Mine. No other group has even come close. 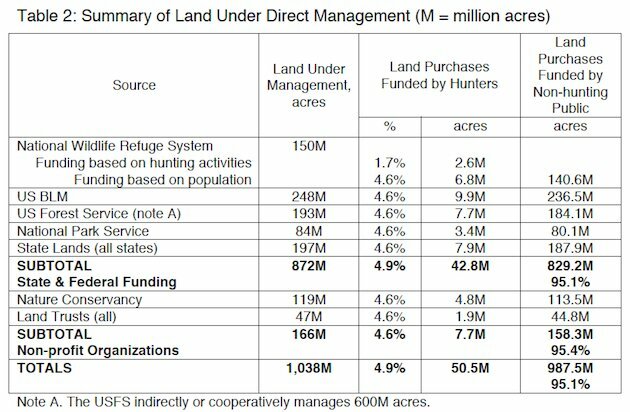 The most effective Western public lands advocates have been groups like Backcountry Hunters & Anglers (of which I believe Wuerthner is a member), Theodore Roosevelt Conservation Partnership and Trout Unlimited. While there are a lot of hunters who are not ecologically minded, there are also a lot of us who are. Don’t discount us. Finally, I read (hopefully incorrectly?) an undertone to this story that suggests hunting has no place on public lands, and perhaps not in conservation. On that point, I disagree completely. I believe hunters are the most effective public lands advocates. And I won’t deny that I believe hunting is a worthy activity that I will defend. So, yes, let’s examine the North American Model. But let’s be clear about what is ultimately best for wildlife and for public lands. I see thoughtful hunting as a part of that picture. Thank you for your thoughtful comment Matt. I think you are correct in your assessment of this model preventing mass extinctions around the turn of the century in this country, but the truth of the matter is, the North American Model was created because the trappers, hunters and anglers were in fear of having nothing left to trap, hunt, and catch. One of the problems I see with the current model is that there is no concern for natural predators in the plan. Witness the killing of over 3,400 wolves since they were delisted a couple of years ago in the West. Several studies have shown that natural predators are essential for maintaining biodiversity and that killing our natural predators is detrimental to the natural balance of predators and prey in the wild. Mass killing of coyotes has been going on for over a hundred years in direct conflict with one of the tenets of the current model that “Wildlife Should Only be Killed for a Legitimate Purpose,” – a philosophical and legal ban on wasteful and frivolous killing of wildlife. These issues concerning the way predators are treated is because they are seen as competition to hunters and trappers. This is one of my main objections to the NAMWC. 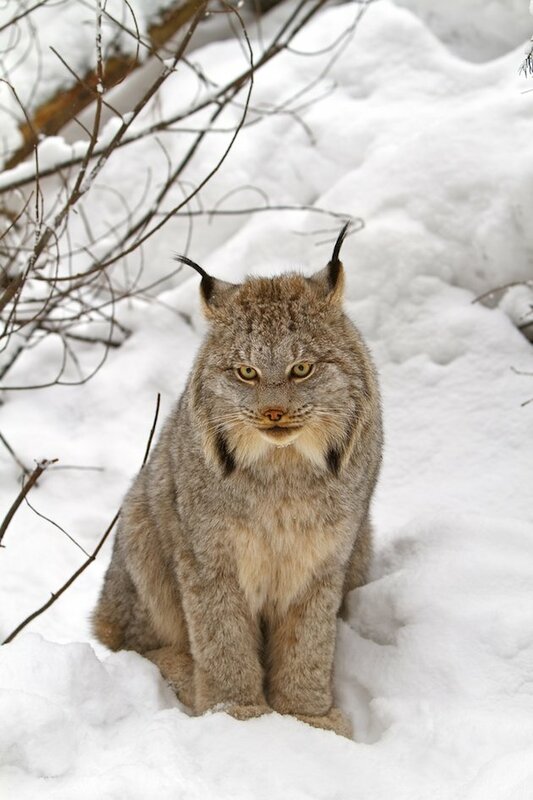 The other HUGE issue is the fact that commercial trapping is allowed, which I believe most Americans consider “frivolous killing” of wildlife, especially since much of the pelts are sold to foreign markets. I understand that the fishing industry in Alaska was a major force in stopping the Pebble Mine and keeping Bristol Bay safe for future generations but I believe that conservation organizations like your own Nature Conservancy and the National Resources Defense Council (both composed of only 4.6% hunters as shown in the study) were instrumental in its current defeat. Of course the assessment of the project by the Environmental Protection Agency (EPA) will undoubtedly be the most important influence on the final decision on the Pebble Mine. I don’t suggest that hunting has no place on public lands but I would certainly contend that hunting and trapping have no place in National Parks. I believe that “thoughtful, conservation minded hunting” can be a force for wildlife conservation but only if it is backed by scientific evidence that it is necessary to correct an ecological imbalance (which is usually brought about by human intervention) such as feral hogs that destroy habitat for native animals. Where are those “thoughtful, conservation minded hunters?” Why aren’t they speaking out against killing contests? Why aren’t they speaking out against the cruel and barbaric practice of trapping. 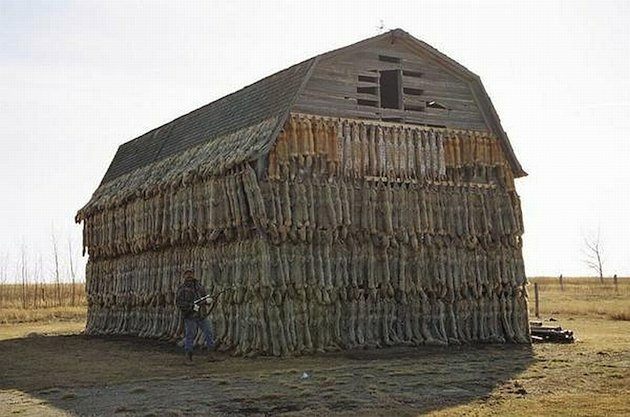 Why is commercial trapping allowed in the United States at all when it should be prohibited as part of the North American Model? Anyone wanting to see what trapping wild animals is like in reality needs to watch “Cull of the Wild” and then try to defend this animal torture. Again, we agree. Let’s examine the North American Model, and let’s be clear about what is best for ALL wildlife and the biodiversity of the planet. A true conservation model should be aimed at conserving ALL species and restoring ecosystems, not catering to special interest groups that represent a small minority of the general population. Reforming the USDA’s “Wildlife Services” branch should also be a concern to all U.S. citizens. Here is a program that spends over $100 million annually to kill more than a million wild animals, much of which is done under the guise of “predator control” to prevent commercial livestock losses. But alas, that is another subject that needs to be addressed. Assuming this thread is fairly safe since it is Old! timothy dot barksdale at gmail dot com …. I think your points are also well thought out and intentioned. Appreciate your conversational tone. This is often missed between our groups. Many of my friends here in Montana are hunters and the subject of our upcoming film for PBS is about a species still common enough to be hunted in at least a few states. Maintaining populations to this level is probably critical at this moment to the species survival- let alone to maintain sufficient genetic diversity. This is really important as we may need to reintroduce these birds into states which have lost populations and habitat for now. I am an active proponent of finding blocks of habitat and restoring it in sizes sufficient to do something in that space. “Postage stamps” will not work for maintaining populations unless there are huge numbers of the blocks. But in the end not even hunter’s voices will be sufficient to prevent the coming extinction of species. The only way to prevent this is to reach to much larger masses of urban and suburban people on a world wide basis. We need to reach them bringing rational positions to effectively create global solutions to global ecological problems. We must offer coherent solutions which prove to them the values and needs which they don’t even know they need to survive. So many urban dwellers are totally disconnected from nature, that it is only natural that Hunters and all those who understand the outdoors unite for the common good. An Owl Swimming. Yes, You Read That Right. Can GM Skeeters Save Hawaii’s Birds? What is a Night Heron? What is the Shortest Day of the Year?